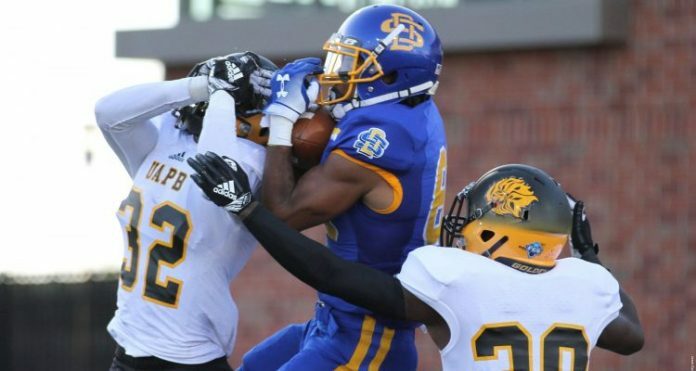 South Dakota State rewrote its record book numerous times Saturday night, including setting new standards for points and total yards, in a 90-6 victory over Arkansas-Pine Bluff in the 52nd Annual Beef Bowl at Dana J. Dykhouse Stadium. SDSU needed only five offensive plays to score its first three touchdowns — all on passes from senior quarterback Taryn Christion. After a 29-yard punt return by Marquise Lewis put SDSU deep in Golden Lion territory, the Jackrabbits needed only two plays to cash in as Christion found freshman tight end Blake Kunz over the middle for an 8-yard score. UAPB, which played without regular starting quarterback Shannon Patrick, went with Roger Totten II under center. He completed 9-of-21 passes for 131 yards and was intercepted twice — both in the end zone by Zy Mosley.